Certified copies of marriage certificates in Sublette County can be obtained from the Clerk's office. Information is available at http://www.sublettewyo.com/index.aspx?NID=120the fee for a certified copy is $5.00. Statewide reporting of Wyoming vital records commenced in 1909, 19 years after it was granted statehood. Birth records are sealed for 100 years; death, marriage, and divorce records are sealed for 50 years. Records in the public domain can be obtained from the Wyoming State Archives at http://wyoarchives.state.wy.us/. 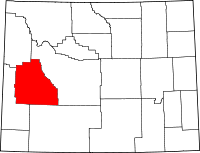 Sublette County was created in 1921. Historically, the area was important to the fur trade, and the county itself takes its name from one of Wyoming's early fur traders, William L. Sublette.